Editor in Chief: Dr. Ir. Ramal Yusuf, M.Sc. Agroland: The Agricultural Sciences Journal is an Open Journal System published by Faculty of Agriculture Tadulako University and Indonesian Society for Major in Agriculture (PISPI), is published twice a year in June and December. This journal provides a multi-disciplinary and international platform in which young and senior researchers can present their work on all aspects of tropical agricultural to other researchers, policy makers and professionals. 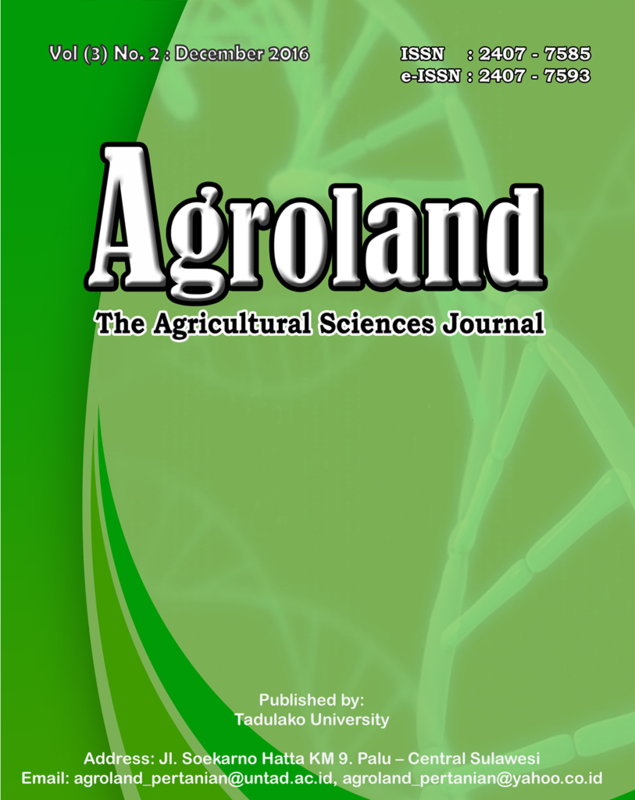 You are welcome to submit your research to the Agroland (The Agricultural Sciences Journal) in Volume 6 Number 1 (June 2019). You can read Author Guidelines and download Journal Template (Ms.Word).